How Miscommunication And A Simple Mistake Led To A Toxic Accident : Shots - Health News Somebody poured a solution of industrial strength bleach into a 55-gallon drum, triggering a release of toxic chlorine gas a Tyson Foods plant. Language barriers contributed to the accident, government investigators concluded. 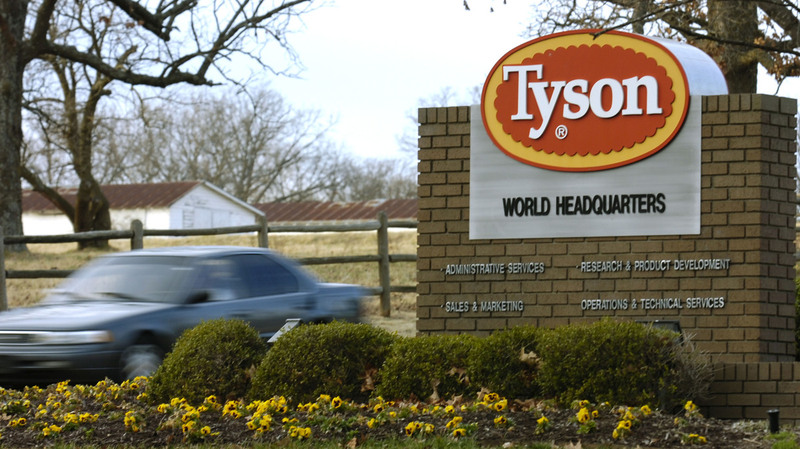 The Centers for Disease Control and Prevention says the accidental release of chlorine gas at a Tyson Food plant could have been prevented with better communication. A year and a half ago, a mix-up at a Tyson Foods chicken processing plant landed more than 150 workers in the hospital. Five required intensive care. The problem: Somebody poured a solution of sodium hypochlorite (think industrial strength bleach) into a 55-gallon drum that had contained an antimicrobial solution identified as FreshFx. That stuff was acidic, according to investigators. Mix bleach and acid, and you can make a lot of chlorine gas in a hurry. At the Tyson plant in Springdale, Ark., that toxic gas spread quickly. About 600 people working there were evacuated. Four months later, 116 workers had asthma symptoms related to the release. More than 100 had symptoms of posttraumatic stress disorder. At six months, three people showed symptoms of a type of severe asthma caused by exposure to irritating chemicals. "This chlorine release and its resultant health effects were preventable," the Centers for Disease Control and Prevention concludes in a report published Thursday in the Morbidity and Mortality Weekly Report. An investigation by CDC's National Institute for Occupational Safety and Health found that the root cause of the problem was a failure to communicate. The worker who mixed the chemicals by mistake "had limited English skills, and was unable to read the label on the drum that had been inadvertently left in the wrong place," the report concluded. The NIOSH study incorrectly identifies the employee who accidentally mixed the chemicals as being Spanish-speaking. The worker responsible is not Hispanic and his primary language is English. In addition, this employee had previously received hazardous chemical training. CDC stood by the reports. The published material "is accurate," spokeswoman Christina Spring said in an email to Shots. A separate report from NIOSH, also cited labels only in English combined with a lack of English literacy at the plant as broader safety issues. Most employees at the plant spoke Spanish or Marshallese (the language of the Marshall Islands) rather than English as a first language. "While there's no question this was an unfortunate incident, we acted responsibly in addressing it," Tyson's Mickelson said. The CDC report doesn't reflect the changes Tyson has made to prevent problems like this from happening again, he said.